About | About – Wise Wildfire Inc.
Amy Wise is the owner and operator of Wise Wildfire. 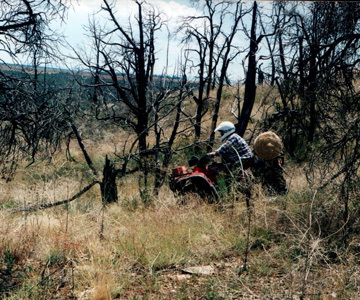 As a former Southwest Colorado BLM archaeologist, for several years, she did fire risk assessments and fire mitigation planning on over 8,000 archaeological sites as well as completed post-fire mitigation treatments on several hundred burned archaeological sites. After several years of this rewarding work, she decided to divert her focus from the federal lands to pre and post-fire mitigation treatments for the small, private land owner. Wise Wildfire accomplishes all of these fire mitigation services following the National FireWise and Colorado State Forestry guidelines. Wise Wildfire services are provided with liability insurance and contracts, operating in Montezuma, Dolores, La Plata, San Juan, and Archuleta counties in Southwestern Colorado.